Kathryn Williams has a unique role in Queensland’s legal framework. As the Deputy Official Solicitor she supports a legal practice of over 50, providing legal support to the Public Trustee in his various roles. There is an increasing focus on legal action to protect those clients who may have been subject to financial abuse. 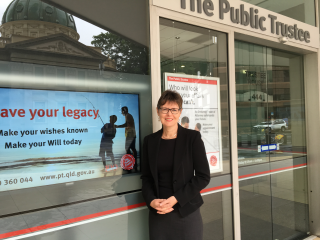 The Public Trustee turns 100 years old this year and lawyers have played an important role in this statutory body since the office’s inception. The Public Trustee has over 600 staff across 16 regional offices and undertakes a diverse range of activities from deceased estates administration, financial management for people with an incapacity, and trust administration. We interviewed Kathryn about her unique justice journey. Kathryn Williams studied law at QIT, now known as Queensland University of Technology and then commenced her articles in a private law practice, where she remained for nearly 7 years. In 1991, she started working at the Official Solicitor’s office and has worked across a number of practice areas. Kathryn was appointed to the role of Deputy Official Solicitor in 2012. She is also a member of the Public Trustee’s Operational Performance Group. When asked about what Kathryn enjoys about her role she replied that she enjoys the diversity of the work of the Public Trustee. “I work with a range of professionals across a large range of disciplines,” she said. “I enjoy the interaction with staff from our Client Services, Finance, Investments, Property, HR and Marketing areas as well as being part of the consultative process with officers from the Department of Justice and Attorney-General (DJAG) on new legislation”. When asked what advice Kathryn has for upcoming lawyers, Kathryn advised that it is important to allow yourself time to grow. For more information, visit www.pt.qld.gov.au.